As citizens living along an international border, young people in San Diego and Tijuana need to have a strong understanding of the interdependence of natural resources in a larger, global setting. Water quality is an especially important concern – from our bays and oceans to our drinking-water resources and shared watersheds. 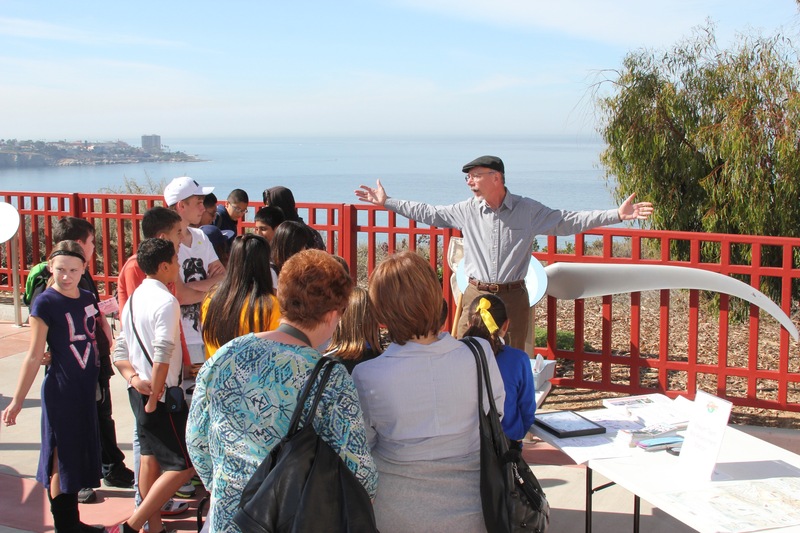 Last week, Birch Aquarium at Scripps hosted the 10th Annual World Water Monitoring Day with San Diego Coastkeeper and Sister Schools of San Diego as part of an international outreach to build public awareness and involvement in protecting water resources around the world. 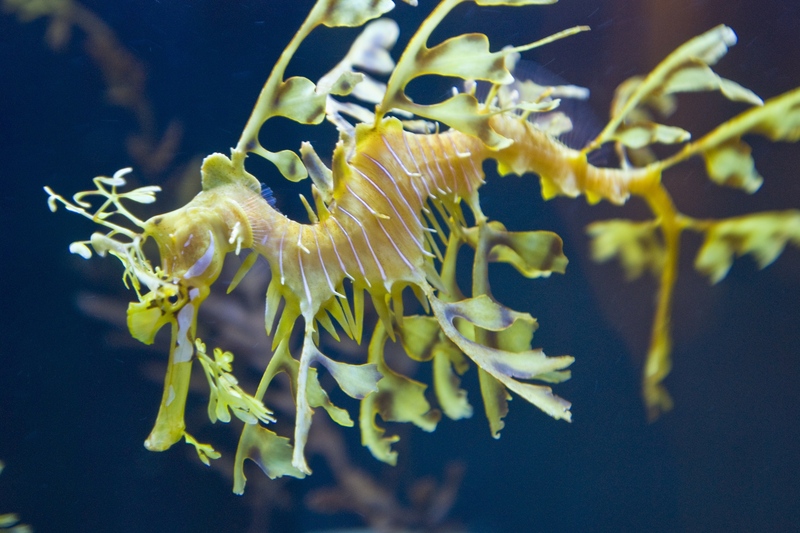 The event featured environmental- and ocean-themed educational activities for approximately 200 school children from San Diego and Tijuana. This was our first year hosting the event. During the welcome address, all attendees were sworn in as official members of Coastkeeper, and executive directors Nigella Hillgarth (of Birch Aquarium at Scripps) and Gale Filter (of San Diego Coastkeeper) addressed the need for public stewardship of water quality in the San Diego region. 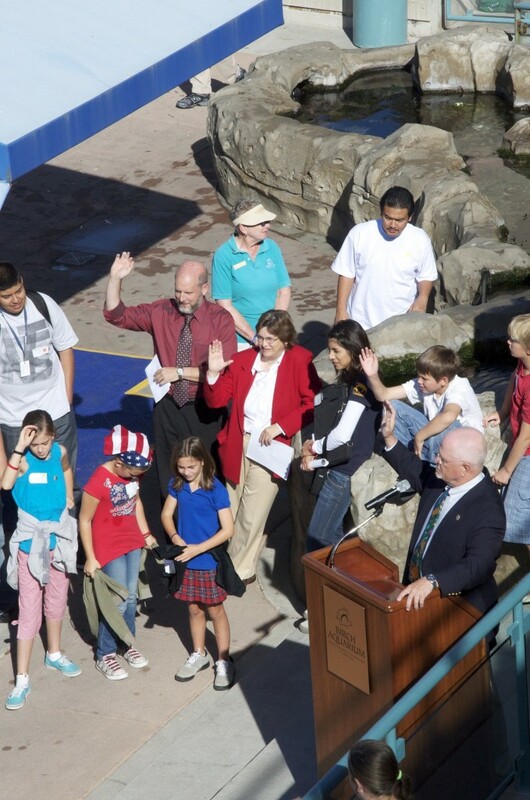 Attendees are sworn in as Coastkeeper members with Aquarium director Nigella Hillgarth (in red). Afterward, students rotated through a number of interactive water stations. At one stop, they explored watershed models and discovered how urban waste and runoff contaminate our oceans. 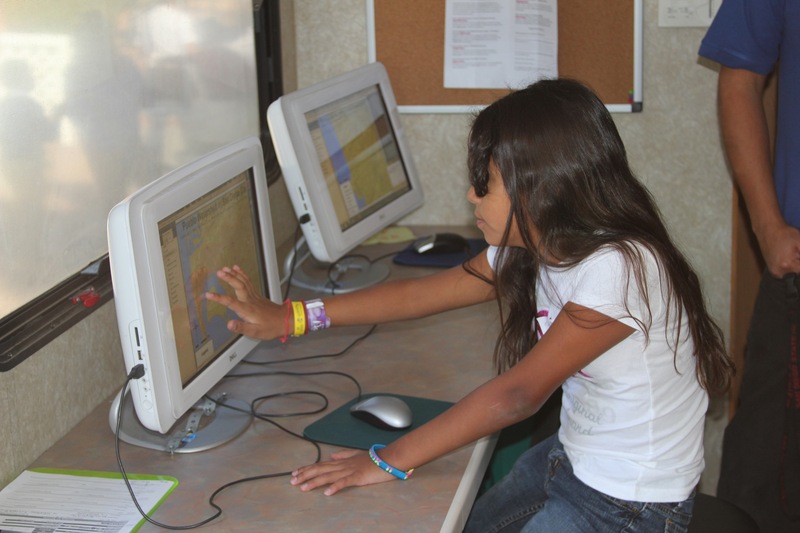 At the San Diego River Foundation’s station, they learned about the flora and fauna of rivers in our region. 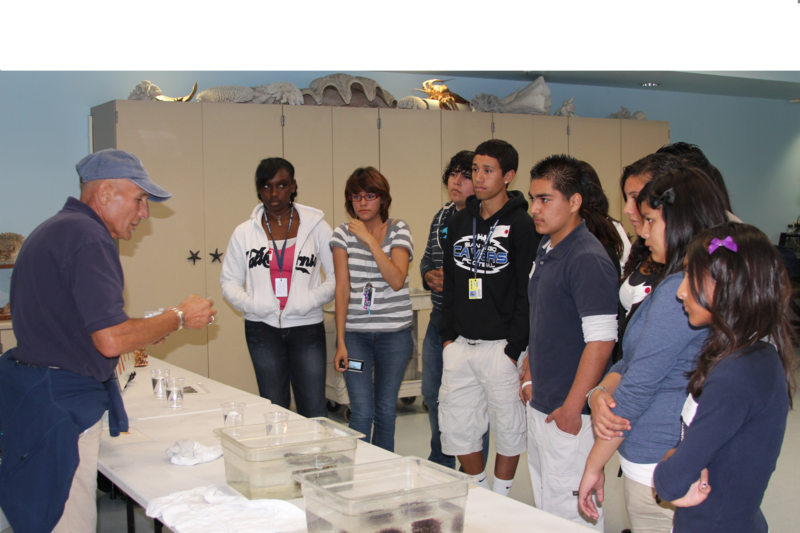 Older students learned how increased acidity affects our oceans as well as the harmful effects of human-caused eutrophication from untreated sewage effluent and agricultural run-off. San Diego Coastkeeper’s edible aquafer station was a big hit as students created their own aquafer from ice cream, candy, and soda. At I Love A Clean San Diego’s recycle relay, student teams engaged in a lively competition to properly recycle common household items. For example, did you know you can recycle round yogurt and dairy tubs as well as berry baskets? Finally, students made their way to the County Office of Education’s mobile labs – Green Machine and the Splash Lab – to learn about watersheds and the importance of composting. 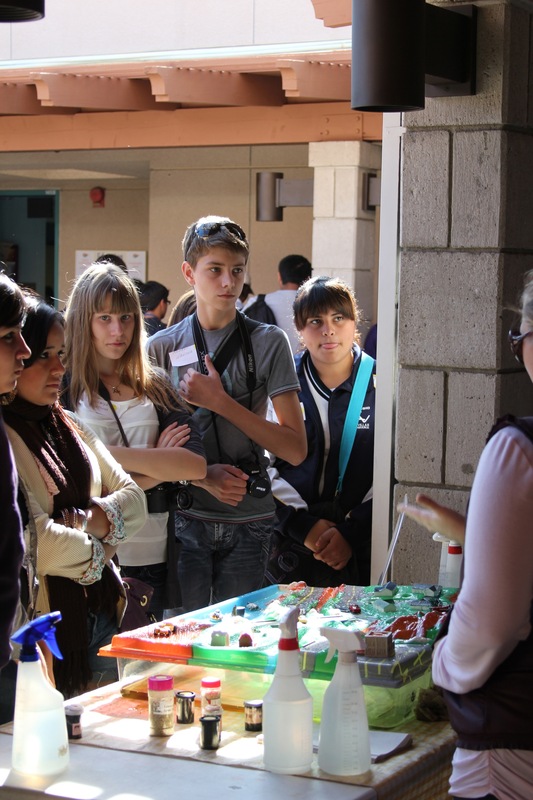 In addition to World Water Monitoring Day activities at Birch Aquarium, the students will use test kits to collect and analyze water samples throughout the region. Their data will be shared with participating students in China, Japan, Poland, Turkey, and Russia. San Diego schools involved in WWMD include Riverview Elementary, Perkins Elementary, San Diego High School and Crawford High Education Complex. 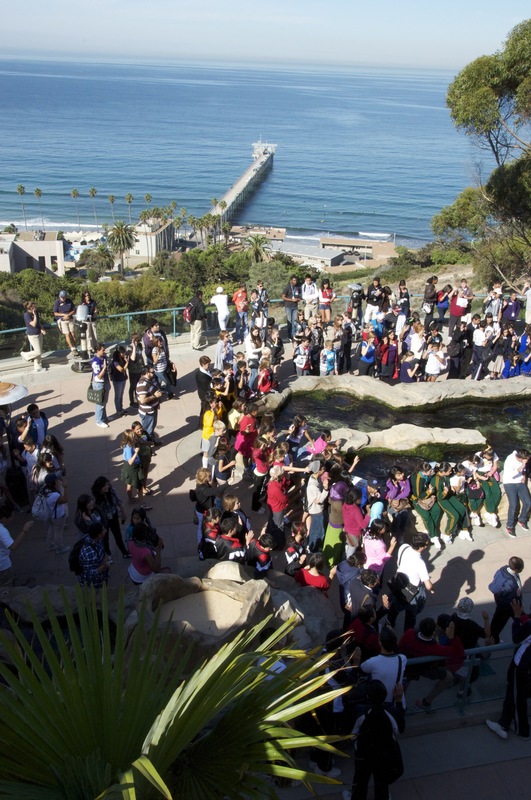 Tijuana schools include Instituto Bilingue Santillana Del Mar, Colegio Holly Cross, Colegio Gabilondo Soler Cri-Cri, Instituto Juan Diego, Instituto Defensores de Baja California, Colegio Eiffel, Colegio Las Villas, Instituto Metropolitano and the Instituto Edubyte. Attendees are sworn in as official members of Coastkeeper alongside Birch Aquarium executive director Nigella Hillgarth (in red). This is fantastic! We would love to include your monitoring data in our 2011 report. Have you guys registered? Also, if you will, we’d love for you guys to send over some of your event photos to include in our WWMD 2011 Album. Thanks for your participation in World Water Monitoring Day! (Contact: wwmd@wef.org).